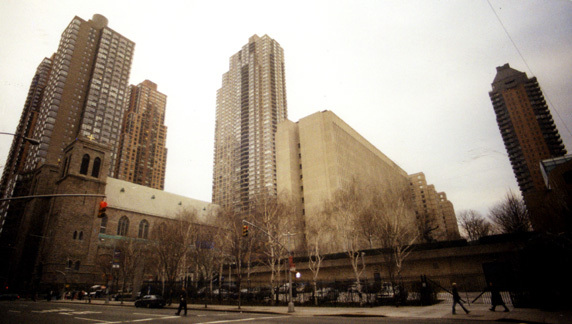 The land-use committee of Community Board 7 expressed many concerns in 2008 about the planned major redevelopment by Fordham University of its Lincoln Center campus. 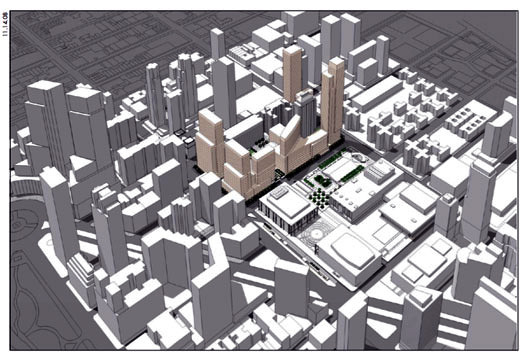 It unanimously approved a resolution disapproving the university's proposed master plan for the site but stated that it would "strongly consider" approval of a revised plan that "(a) limited total floor area on the site to 2,500,000 square feet; (b) substantially reduced the height of the Amsterdam Avenue buildings; (c) substantially reduced the height of the Columbus Avenue buildings and reconfigured those buildings so as not to create monolithic full block-long facades; (d) provided for mitigation of the probable effects on local schools of the construction of several hundred private residential units; and (e) provided for a second tier review and approval by the Community Board and the City Planning Commission of the actual design of buildings on the site." In the Spring of 2009 the City Planning Commission approved the university's plans, which had been somewhat revised with some of the towers being made shorter. The university wanted to add about 2,350,000 square feet of space to its existing campus on the "superblock" bounded by Amsterdam and Columbus Avenues and 60th and 62nd Streets, directly south of the Lincoln Center for the Performing Arts. Sidney Goldfisher MD, the president of the Alfred residential condominium tower at 161 West 61st Street, which is very close to the site, submitted an 8-page letter for the community board in opposition to approval of the master plan stating that "the basic concept behind the master plan and its current execution are totally inconsistent with the letter and spirit of the basic principles upon which the campus was created and therefore is fundamentally flawed." "The wall of skyscrapers and high rises that Fordham hopes to build on West 62nd Street will break forever the link between the Collegiate center and the Center for the Performing Arts," the letter continued. .That meeting began with a disingenuous statement by Fordham's counsel that Fordham had purchased the land in the open market and that, 'it is our land and we will build what we want, where want and when we want.'" His letter suggested that "an ethical and workable compromise may yet be attained," but would require "that the destruction of working class homes and the forced removal of more than a thousand families from their homes be memorialized by new educational or community facilities and not by two 60-story luxury condominiums." .The proposed campus will have much more in common with a Trump or Extell development than a collegiate center." His letter also attacked the retention of the site's "podium that separates the campus from the community" and its lack of provision or concern for the lack of elementary and middle school facilities," and "egregious environmental insults including destruction of St. Peter's garden and two extraordinary stands of white birch trees." The land-use committee of Community Board 7 expressed many concerns about the planned major redevelopment by Fordham University of its Lincoln Center campus. Richard Asche, the chairman of the committee, remarked at the end of the lengthy meeting that he did not "think Columbia [University] ever did anything this bad," a reference to the perpetual town/gown conflicts of both Columbia and New York universities with their expansion in their neighborhoods. Fordham had been meeting with the city's Department of Planning prior to having its plans "certified" into the city's Uniform Land Use Review Process (ULURP). Last spring, the university gave the community board a presentation of its plans, but a spokesman for the University, Joseph Muriana, told the committee that the plans had since been refined. Hope Cohen, the board chairperson, wrote Amanda M. Burden, the chairperson of the City Planning Commission to express the board's "deep and extensive concerns" about the university's master plan. "The Fordham Master Plan, if fully executed in the manner presented so far," her letter stated, "would create a superblock campus walled off from its neighbors, our community. Fordham proposes 35- and 36-story academic/dormitory buildings (approximately 450 feet high) along the Columbus Avenue frontage of the campus (West 60th Street to West 62nd Street). It proposes lower fortress walls of academic/dormitory buildings (5-21 stories, approximately 185-235 feet high) along West 60th Street and West 62nd Street between Columbus and Amsterdam Avenues." "And," her letter continued, "it proposes to pay for much of this construction by selling two parcels along Amsterdam Avenue to a private developer for development of luxury residential buildings to tower over Amsterdam Houses to the west (47-story building, approximately 500 feet high, at Amsterdam & West 60th Street; 57-story building, approximately 610 feet high, at Amsterdam & West 62nd Street)." Her letter maintained that "essentially, Fordham wants to take itself out" of the Special Lincoln Square Special District. In addition, the letter questioned the use of real estate development to underwrite not-for-profit capital and programming costs. An article by Lois Weiss in The New York Post said that Fordham was "apparently in contract to sell its Lincoln Center area development parcels to New Jersey's Fisch family of Continental Properties," adding that "while the price could not be confirmed, the University needs the sale to bring in at least $300 million to fund its own redevelopment plan that would double the size of that campus." Mr. Muriana, assistant vice president of government and public affairs for the university, told the committee that the university will share refinements to the plan with the community and that it is a 25-year plan. Michael Groll, the president of 44 West 62nd Corporation, the cooperative board of a nearby building, told the subcommittee that his building and 5 others on Columbus Avenue were concerned about Fordham's expansion plans. "We were shocked" that it plans a more "fortress-like" plan that would put the campus "further away from its neighbors." "Ignoring the region's overwhelming traffic congestion and its attendant pollution, Fordham's proposal calls for an explosive growth in parking on the site from 35 to 595 cars, a 17-fold increase!" declared Sidney Goldfischer, the president of the Alfred condo association of 161 West 61st Street, who spoke in opposition to the university's plan and also wrote a lengthy letter about it to the committee. Open public spaces, he continued, would be reduced by 50 percent, adding that "The Law School, library and new dormitory would be so close to the existing buildings that they would virtually re-create the dark and stifling airshafts of the 19th Century tenements that were condemned and demolished in 1957." The revised expansion plan did little to address the fundamental planning issue that way too much building is planned for such a small site and that no attempt has been apparently made to relate contextually to Lincoln Center, which is in the process of brutally destroying much of its architectural heritage (see The City Review article). The existing law school is quite attractive and its landscaped "podium" is also attractive. The notion of adding many new buildings to this site is preposterous. One or two large towers could easily be accommodated but that option has apparently not been examined or suggested by anyone. A large part of this problem relates to a great deal of ambivalence in the design and planning communities to Lincoln Center. On the one hand, no one argues that the center's varied cultural activities are significant and fine and have led to a major redevelopment of a large area of the Upper West Side. On the other, some observers feel that the complex, and many of its surrounding unrelated towers, are uninspired and are not much of an improvement over the tenements that the center replaced. Part of this is old-fashioned generational vomit: Out with the old! Bless anything that is new! Damn the public and the city! Such simplistic drivel sadly holds much sway in the community. The community board, of course, has shown some courage in seeking to lower the heights of some of the proposed buildings, but it stopped way short of condemning the plan altogether as a terrible planning exercise. There is no question that the urbanistic value of Lincoln Center now is primarily that it provides some "light and air" in this very much built-up area, an area that certainly has some tall buildings such as the Time-Warner Center and 3 Lincoln Center. Educational institutions are very important but it is shocking and almost beyond belief how poorly these supposed cultured bodies have demeaned and scarred the city with very inferior and very unattractive architecture. The answer is not to make more historic districts but to rezone Manhattan to take real notice of the many important changes that have occurred. At one point, it looked as if the Coliseum would never be replaced and who could have imagined what a magnet a large Whole Foods store could be or how horrible the defacing of Alice Tully Hall is to the integrity of Lincoln Center and why lifted-up lawns and electronic steps should make us ignore architecture.